The stall plaque of Julianne Anderson’s childhood horse, Velvet, still leans on a bookshelf in her home in Tom Miner Basin, Montana. The dirt road leading to Tom Miner crosses the Yellowstone River 19 miles from the main northern entrance to Yellowstone National Park. It enters its own distinct corner of the Greater Yellowstone Ecosystem. The road weaves across Tom Miner Creek and past an old ranch house, then turns sharply right, rising with twists and turns up Transfer Hill, named for the place where cattle were loaded out of the basin when trucks couldn’t make it any further during autumn snowstorms. After a few miles of climbing, the road levels off and the basin opens up to a grand spectacle of mountains and meadows. Some people know Tom Miner as having served as a backdrop for Rancho Deluxe that starred Jeff Bridges, Sam Waterston, Harry Dean Stanton and Slim Pickins. The screenplay was written by acclaimed American novelist Thomas McGuane, who lives over the next mountain range, and it featured music by McGuane’s brother in law, Jimmy Buffett. In the next, without missing a beat, she was back telling me her stories with a calm that belies the struggles she has been through. This time, the story was about her childhood horse, Velvet. Leaning back in her chair she puts her reading glasses aside and raises her eyes to the window and rugged line of summits beyond. “It’s funny how through one's life animals are markers along the life line and they keep memories soft and rich,” she muses. Julie’s father bought Velvet, a sorrel quarter horse/ Appaloosa cross when she was 12. They kept the purchase a secret from her mother, who feared horses and believed they “just were not ladylike,” but her father could see that she needed horses. If nothing else, they would give her an escape from her four rambunctious brothers. Julie spent most of her free time at the barn just a short walk across the fields over from her home in Michigan. “I would go sit in Velvet’s stall with her and she would come nuzzle my head. When I had challenges, I had this ballast, this someone to go to,” she explained. Julie parted from Velvet when she had her daughter, Julie, at age 18. As hard as it was to say goodbye to her childhood horse, she left for nursing school in Saginaw, Michigan. But she had always wanted to go west. Several years later, with her nursing degree and after a short stint in Cooke City along the way, she ended up in Corwin Springs, Montana, working as a nurse in Livingston and caring for her daughter as a young single mother. Fortunately another horse, Dolly, entered her life. 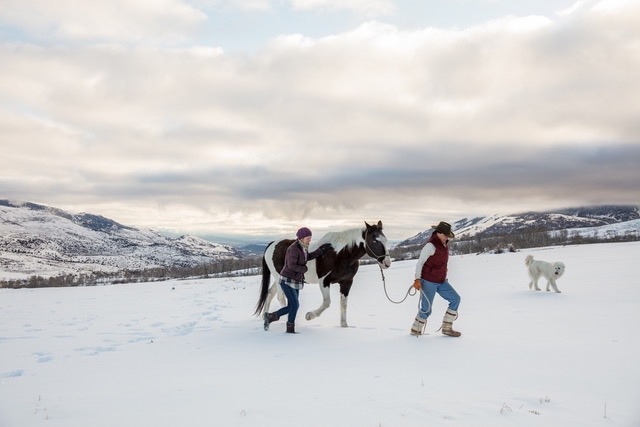 “It was very important for me to have horses in my children’s lives because I knew what an impact they had on my life.” One day at the grocery store in Livingston she overheard a woman talking about a ranch house she needed to rent up in Tom Miner Basin. Thinking this might be a place to keep Dolly, she inquired and followed her new friend, Connie Malcom, up Tom Miner Road. The scene that then 23-year-old Julie Anderson came upon was breathtaking. 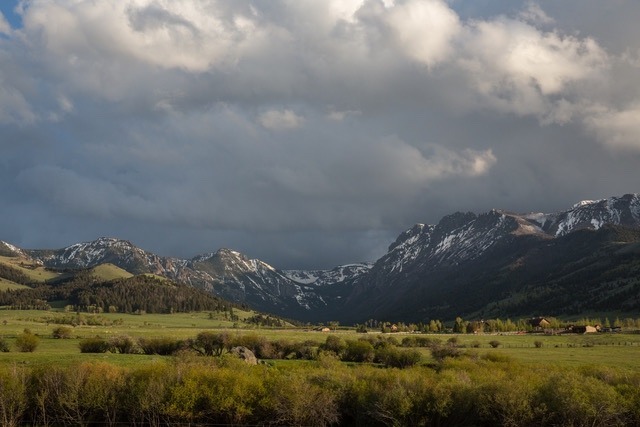 Tom Miner’s backdrop is the southern Gallatin Range’s rugged peaks, engulfing fields of sage brush, clumps of aspen groves and Douglas fir which make for ideal horse and cattle pastures. Elk graze on hillsides, and sometimes a grizzly bear ambles through in the late summer. Cresting the top of the final turn, an old stone home reveals itself, standing behind four tall pine trees. Amidst the wildness pulsing from the high tips of the sawtooth ridge to the fields of timothy grass, the upper basin forms a bowl shape, embracing life inside this landscape tucked away from busier Paradise Valley. Hannibal Anderson’s parents had settled in Tom Miner in the mid 1950s and his mother, Virginia Anderson, firmly planted roots there to raise their four sons. 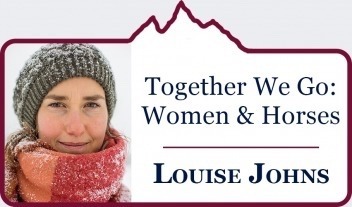 Julie has found her way from being a young single mother to cultivating a home on a beloved Montana ranch, all the while working as a highly accomplished nurse and physician’s assistant. Her work has taken her around the state of Montana from the Mammoth Clinic in Yellowstone, to hospice care in Paradise Valley, to Livingston Hospital (to name a few). She’s taken care of people as far south as Ecuador and as far north as the island of Shishmaref, Alaska where she works to this day. She tells stories of working in a leper colony on Molokai Island in Hawaii, and rescuing people from their homes in Alaska’s most remote and rural native villages in below zero Bering Sea snowstorms. Through all of this, she recognizes horses as beings that have grounded and given her the security that has helped her find her way. Even when she is away from them physically, these equine relationships have helped her through some of the most pivotal moments in life. 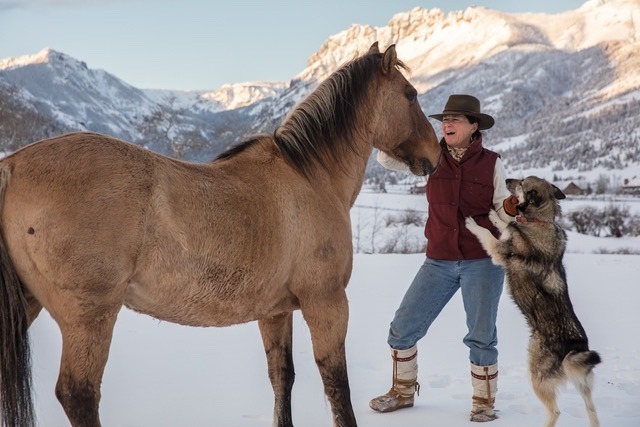 “We learn so much from the horse— through that eye and through that heart,” says Julie, whose wisdom has guided me in the short years I’ve known her and adopted the country, like her, as my own. 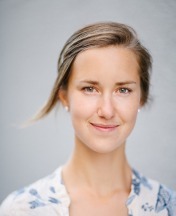 Julie Anderson, like many women of the West, navigates her life with steadfastness, grit and grace. Her gift of presence comes, in part, from her life with horses. But Julie sets the stage for a trend shared among women. It stems from a love of horses and it is a thread that brings us together.